Whether you or someone in your home suffers year-round or seasonally from allergies or asthma, there are ways you can reduce the misery by cleaning correctly to remove allergens. Allergens can be any substance that causes an allergic reaction. Common household allergens are dust mites and insect droppings, pollen, pet dander, and molds. Regular weekly cleaning of your home is an important part of an allergy management plan. 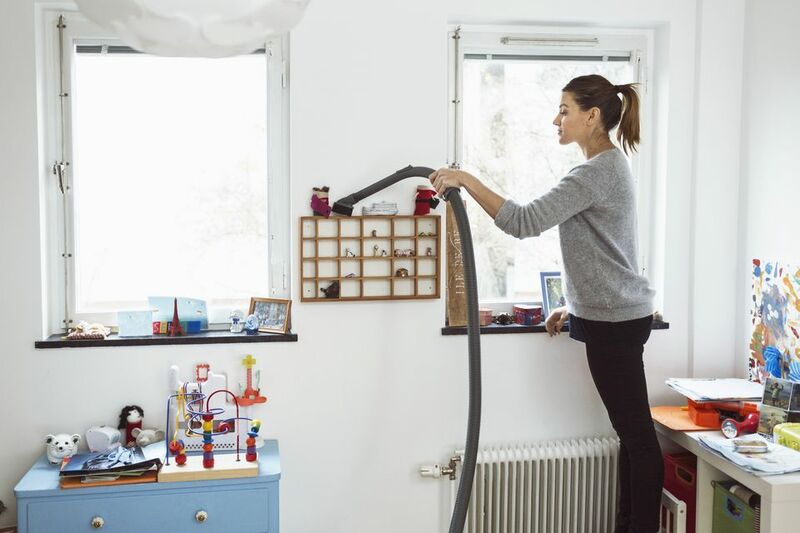 Even the act of cleaning–especially if it hasn't been done in quite awhile–can trigger allergy symptoms as dust and other allergens are stirred up. If cleaning has been neglected for several weeks, wearing a protective mask is a good habit. Use the proper tools and cleaning products to trap allergens and prevent exposure to chemicals that might cause allergic reactions. Vacuum: If you don't have a fine-particle Hepa filter vacuum, use a double bag to trap as many particles as possible. For bagless vacuums, regularly clean and wash out the collection cup. Fabric Allergen Sanitizer Vacuum: These vacuums use ultraviolet light to kill dust mites and bacteria and then a dual filtration system to eliminate 99.9% of the offenders from fabric surfaces. Washable Microfiber Cleaning Cloths and Mops: Microfiber cloths will attract dust better than cotton or paper towels. Choose tools with removable heads that can be tossed in the washer for a thorough cleaning. Dampen mops and cleaning cloths lightly before using to attract the most dust. Disposable Dust Wipes: Synthetic dusting wipes and wands attract dust and create static cling that will hold the dust until it can be disposed of in the trash. Protective Masks and Gloves: Opt for disposable or washable masks. Avoid latex gloves and choose cotton-lined rubber gloves instead to prevent skin irritation. Laundry Products: Choose detergents and other stain removal products that are dye free and unscented. Studies have shown that dye is often the culprit in skin irritation. These chemicals have been identified as potentially irritating. Learn to read labels before you use a cleaning or laundry product. Look for unscented cleaners and use natural products like distilled white vinegar, baking soda, and lemon juice for cleaning. 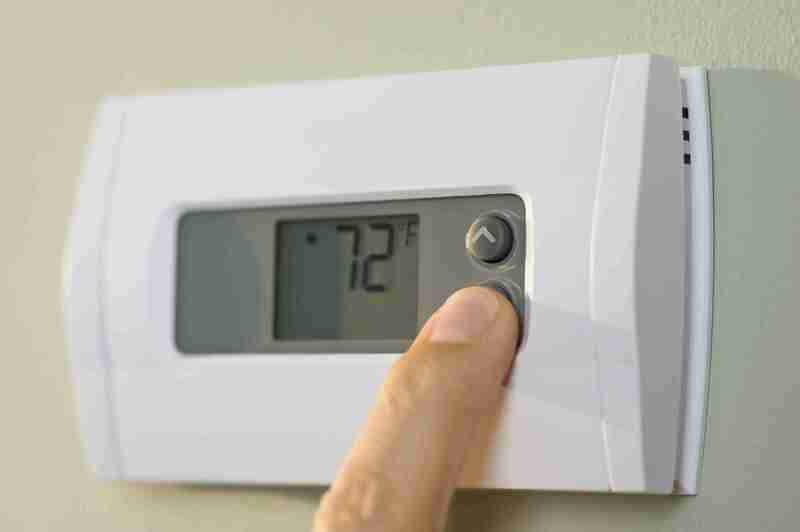 Control indoor temperature and humidity. Dust mites and mold spores like heat and humidity. By maintaining a temperature between 68˚F (20˚C) and 72˚F (22˚C) and a humidity level of no more than 50 percent you can reduce their growth. Use small-particle filters in central heating and cooling systems and in room air conditioners. Change or clean the filters monthly. Control pests like insects and mice. Use traps or a professional exterminator and seal any cracks that may allow them into the home. Remove clutter and dust catchers from living spaces. Do not allow smoking anywhere within the home. Keep pets outside as much as possible. Bathe indoor pets at least weekly and wash their bedding weekly. Since we spend so many hours in our bedrooms surrounded by lots of soft, dust-catching surfaces, it is essential to clean everything weekly. Start with the bed and bedding. Sheets, pillowcases, and blankets should be washed at least once a week in hot water. If you have allergies, never hang bedding outside to dry. The outdoor pollens will come in with the sheets. Choose washable bedspreads or comforters and encase pillows, mattresses, and box springs in dust mite-proof cases. Pillows should be cleaned regularly. Clean the bedroom weekly, starting at the top and working down. Dust ceiling fans and light fixtures. Dust blinds and/or wash curtains. Dust any furniture and using the hand tools, vacuum upholstered furniture. Finally, vacuum the floor including the spaces under the bed and furniture. For the fewest allergens, remove wall-to-wall carpeting and use hardwood or solid tile flooring and washable area rugs in the bedroom. While we love them, it is best to keep pets out of the bedroom and off the bed. Keep closet doors closed to reduce the transfer of allergens from clothing. Use covered plastic bins that can be cleaned easily to store unused items. The most dangerous allergens in bathrooms are mold and mildew. You can halt and remove mildew growth with chlorine bleach, hydrogen peroxide, or a commercial mildew cleaner. Always read directions carefully and NEVER mix different chemicals. To remove mildew build-up, mix a solution of three parts water to one part bleach. Wearing rubber gloves and ventilating the area well, use a stiff brush to scrub the affected areas. For tight corners, saturate paper towels with the bleach/water solution and apply the towels to the mold. Allow them to remain in place for ten to 15 minutes and then scrub and rinse. To prevent additional mildew growth, install and use an exhaust fan when taking baths or showers. After every use, towel-dry the tub or shower enclosure. Check the tub, showerhead, sink, and toilet fixtures frequently for leaks and repair immediately. Always hang towels to dry between uses. Wash rugs, bathmats, and shower curtains frequently to inhibit mildew growth. Just as in a bedroom, start cleaning at the top of the room so that dust and allergens drift down to be captured by a damp mop or vacuum. Dust ceiling fans and light fixtures. Then dust blinds and wash or vacuum drapes using the hand tools. Don't forget to clean window sills and mantles or any horizontal surface. Clean away any ashes or residue in fireplaces. Wipe down wooden furniture to remove dust and vacuum upholstery. Finally, vacuum the carpet or damp mop floors. Wash any throw rugs. Living areas should be cleaned at least weekly and it is best to vacuum carpet every other day to capture the most allergens. If you have plants, cover the soil with decorative rocks or marbles to help contain the natural molds that can grow in damp soil. Artificial plants should be dusted weekly and periodically given a shower to remove dust. Rather than use chemical air fresheners, consider simmering citrus peels or spices like cinnamon and nutmeg to freshen the air. The kitchen is prime real estate for mold growth and insect droppings. To prevent mold and mildew growth, use a vented exhaust fan to reduce moisture. Regularly check the sink, refrigerator, and freezer for leaks and repair promptly. Weekly, clean the refrigerator and discard moldy or out-of-date food. Wipe down door seals, clean drip pans, and mop up spills and excess moisture. Mop floors and wash any throw rugs. Clean the countertops and sink daily. Dishes should be washed after every meal by hand or placed in a dishwasher. All food should be stored in covered containers and the trash emptied frequently to prevent droppings from rodents and cockroaches. At least four times per year, empty and clean cabinets and drawers to remove crumbs. A good way to reduce allergens in your home is to prevent them from coming in. At least weekly, clean outside entryways by sweeping or hosing away pollen. Have everyone in the family take off their shoes before going into the house. Store outerwear in an entry area rather than bedrooms to keep pollen at bay. In the laundry room, check frequently for washer leaks to prevent mold growth. After every dryer load, clean the lint filter and then empty the wastebasket. At least quarterly, check to be sure the outside dryer vent is clean and operating properly. Never vent dryer moisture inside a home. Basements and storage areas can be damp and dusty. If you are using these spaces for storage, use plastic bins with lids to prevent collectibles from gathering dust and mildew growth. If you detect dampness, use a dehumidifier to pull moisture from the air. Check foundations and windows for leaks and repair as soon as possible. Get rid of wall-to-wall carpet and install a hard-surface flooring that can be easily cleaned.